Homestead at Hamilton will provide 195 apartments for independent living, assisted living and memory care. 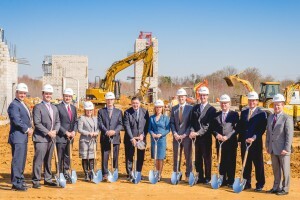 Solvere Living and Pike Construction Co. LLC, co-developer and general contractor, are investing $59.1 million in the project, located in central New Jersey’s Mercer County. Homestead will provide an emphasis on a healthy living environment and concierge-type services for seniors able to live independently, as well as those needing assisted living or memory care. A whole-person wellness program and a range of social activities are designed to support resident independence. There will be 96 independent living apartments; 75 assisted living apartments and 24 apartments for memory-care. The amenities and services-rich community will include: casual and formal dining, bar and lounge; state-of-the-art fitness center and exercise studio; hair salon, spa, theatre, convenience store; transportation, maintenance and repair, along with other features. Fully-refundable, non-interest bearing deposits of $1,000 for Homestead are being accepted now. A sales center will open in late 2016, with the community slated to be completed in late 2017, said Ward. Solvere’s portfolio of managed assets includes owner-investor properties throughout the East Coast and Midwest as well as its own communities. Priced to appeal to a market that appreciates value, Homestead will have a one-time community fee of $3,500 and monthly rentals starting from $3,000 for independent living, $3,750 for assisted living and $5,200 for memory care. Residences range in size from 450 to 1000 square feet and are designed for maximum living space and natural light.